As you will have noticed, I haven't been worried about composition and such since embarking on this challenge, but I have tried to turn in "clean"(-ish) versions of my ideas. Not so today. You are getting a drawing with ink smudges and blah bits and all. And that's ok. This is very much a draft stage, and I need to get that through my head so that I'm not spending so much time on these illustrations. As a former dreadlocked chica and soon-to-be-Frenchie, I have to have a Poitou donkey in the mix! However, this is not the right medium to do him justice. I may try another version later. lol... I was thinking more alpaca-donkey. I love your cedar trees. Really nice texture there. This donkey does not fling himself toward the viewer as some of the others did. He is neither lonely nor mystical; he is self-satisfied and very down-to-earth. He has paused in his activities to watch you pass, but he does not invite your company--you know that, because though his head has turned toward you, his body remains aligned for the activity he will resume once you are gone. By exceptionally weird coincidence, look what another LJ friend of mine posted today (it's more Poitou donkeys). I'd never heard of them before your picture! SO weird how that happens. I like the really furry donkey and the big ears. Picasso went through his "blue stage." You can call yours the "donkey stage". I'm not tired of donkeys yet, but I am getting a bit antsy to work on the other characters. All in good time, I tell myself; all in good time. Ah, but you can draw! Everyone can. I don't mean that to sound trite, but I think everyone is an artist (was as a child and can be again as an adult). It is only when the ha-ha mockery kicks in from (insecure) peers or adults that children lose their passion for drawing. The beauty of art is its ability to Encompass. It doesn't have to Exclude. People are the ones who do that. 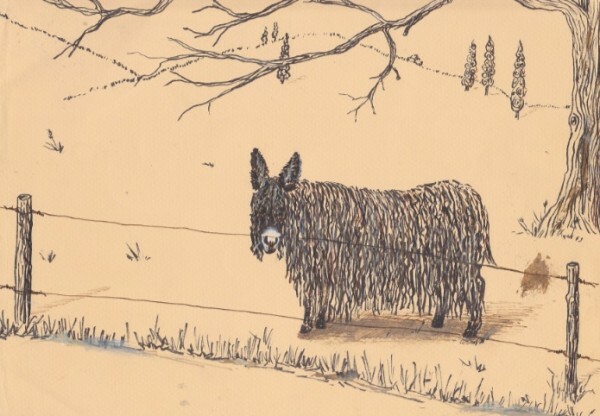 This is a) on seriously hairy donkey and b)such a nice drawing. Are you sketching your travels? I've never been very successful at that. Now I also want a Poitou donkey. Terrific. I like the way it's facial expression as it looks back out at the viewer.